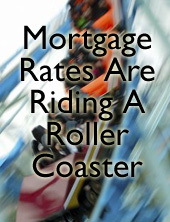 Mortgage markets took a roller coaster ride last week, powered by the dual-force of the Federal Open Market Committee, and the government’s monthly Non-Farm Payrolls report. As standalone events, both releases would have ranked among the top market movers of the year anyway, but throw in the rest of the week’s data –including the release of key inflation figures and the midterm elections — and it’s no wonder the bond markets were so bumpy. Huge gains and losses characterized day-to-day trading last week. Overall, however, conforming mortgage rates improved; fixed-rate mortgage rates fell slightly less than adjustable-rate ones. The Federal Reserve announced a $ 600 billion package to support the economy; more than most estimates. According to the government, 151,000 new jobs were created last month. Economists expected 61,000. Additionally, the Institute for Supply Management’s Manufacturing Index showed strong sector growth. With each new surprise, Wall Street’s expectations adjusted for the future and, therefore, mortgage rates changed. This week, the direction that rates take is anyone’s guess. First, there’s no substantive economic data due for release and, second, markets are closed Thursday for Veteran’s Day. The absence of data coupled with lower volume expected overall may mean that market momentum rules the week. In other words, if mortgage markets open the week better, they may close the week better, too. Conversely, if rates start rising, they could rise by a lot. If you’re still floating a mortgage rate or have yet to call your loan officer about a potential refinance, there’s no better time than the present. Mortgage rates are on a 6-month rally and most eligible homeowners stand to save a lot of money. Make that call this week — just in case market momentum carries mortgage rates higher.